237 p., 7 ill., 14,7 x 20,8 cm. 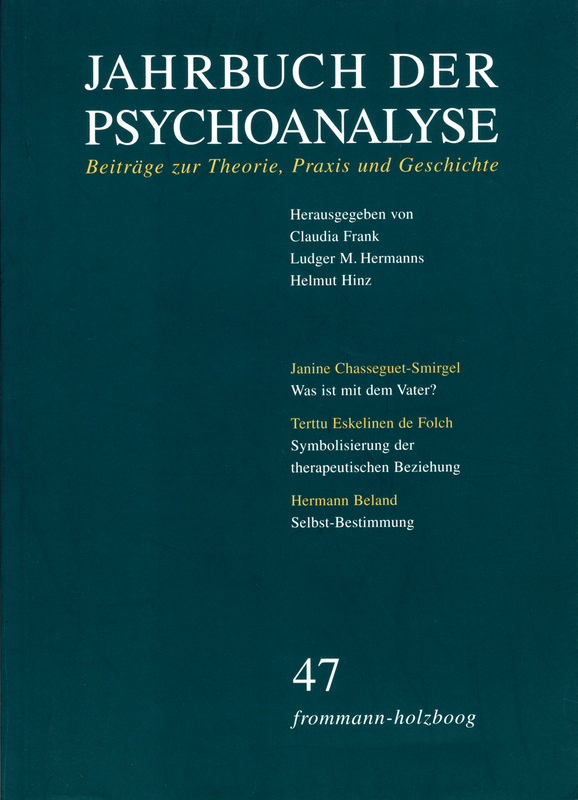 With contributions by Hermann Beland, J. Chasseguet-Smirgel, Friedrich-Wilhelm Eickhoff, Terttu Eskelinen de Folch, Gerhard Fichtner, Lilli Gast, Elke Antonia Natorp-Husmann, Peter Potthoff and Sabine Wollnik-Krusche. The author describes the therapeutic situation as being suitable for the development of the symbolic function. It enables the bringing together of two things with the link of reciprocal significations. And it also enables us to organize the ineffable, ignored and unconscious. In the space of the analyst-patient relationship the internal conflict and anxiety are metaphoricized. The narrow symbolical equations that the child has established between the conflict and its symptomatical expression have the chance to open up to a multiple significance through the analyst’s emotional resonance. Some of Karl Abraham’s scientific interests are connected with the discussion of normal and pathological omnipotence. Freud’s notion of omnipotence of thought is compared with the respective theories of Abraham, Winnicott, Rosenfeld and Bion. The main topic of the paper tries to understand the normal and traumatic circumstances of the enthronement of ruling unconscious beliefs (structures of the system) and their relation to omnipotence. The critical function of intolerance of frustration (Freud’s subjective notion of the unbearable 1911b) for the enthronement of pathological beliefs is demonstrated, among them the identity delusion of omnipotence in destructive narcissism and in psychogenic autism. Janine Chasseguet-Smirgel: Was ist mit dem Vater? The presentation gives a central place to the fantasy of a dismembered body, a fantasy sometimes enacted in certain murders. The main examples are taken from philosophical and literary texts of Michel Foucault, Yukio Mishima and Pier Paolo Pasolini as well as from their biographies with a brief reference to »Suddenly Last Summer« by Tennessee Williams. It happened that, during the investigation of this material, the author discovered that these writers were homophiles. Of course, homophilia gives rise to many other figures, and it is out of the question to consider that it forms a unique scheme. However, three of these writers have a strong (imaginary) relationship to cannibalism, a characteristic which led the author to be interested in the problem of introjection, and thus in the introjection of the father. The paternal function seems to be a »worn out hat«. However, the author tries to deal with it in her own way. She is also interested in the problem of suicide (present at least in two of the writers under scrutiny). She shows how the dismembering of the body may take place either in someone else’s body or in the very body of the subject. Suicide may then be a projection of a self-destructive wish onto the cosmos, suicide and Apokalypse thus becoming one and the same thing. The concept of ›healing‹ as well as efforts to heal, with its magic, mystical, religious, charismatic, political and antisemitic aspects, goes back to pre-scientific times. In this paper I examine the pre-scientific elements as well as the latent meanings of this concept. The concept is one of technical procedure and underlying notions of cultural essentials. In 1998 the PTG (the german Psychotherapy law) represents a rupture in German training of psychoanalysis – here called a ›selected transitory fact‹ – which prompted me to further reflections on the concept of healing. Concepts are loaded with communicative and even political ›force‹ when their pre- and unconscious elements have not been made transparent. Pre-rational ›shadowy‹ aspects of the healing concept lend themselves to enter into alliances with the forces of anti-enlightenment, especially stereotypes and regressive phenomena. This may be considered as a manifestation of symptom and defense against an open construct of enlightenment. Healing in psychoanalysis and depth-psychology is intimately tied to ›the language of the unconscious‹ as well as to complex learning processes of a ›transcendent‹ in affective and cognitive terms of self-object-relations. The authors give a review of the literature on the negative therapeutic reaction (NTR). Diverging theoretical concepts are considered. Emphasis is laid on Fairbairn’s ideas viewing NTR in the framework of his theory of internal object relations. In his theory NTR occurs as a receding of the patient from the therapeutic relation back into his pathogenic internal world. Split-off pathogenic partial-object-relations enter into the transference, can be worked through and eventually resolved there. The degree of NTR is closely related to the extent of schizoid traits in the patient that derive from the intensity of the basic traumatisation. The paper is completed by two case presentations, one describing a severely sexually traumatized borderline patient, the other a schizoid-narcissistic patient. Both cases are discussed on a Fairbairnian background of understanding. This contribution reflects upon the implicit texture of Freud’s friendship with Wilhelm Fließ and depicts it along the different phases of intensity until it’s very end. The main focus is being laid on an analysis of this relationship during the seven years of its utmost intensity and closeness between 1893 and 1900 to which the beginnings of psychoanalysis and the foundation of its main topics and core issues ran parallel. This essay picks up the notion of mimesis and mimetic processes as they were conceptualized by Girard in respect to cultural discourses and by Adorno in the realms of his aesthetic theory and applies it for a test to the analysis of the dynamics of this important and outstanding friendship. Dieser ›Jahrbuch‹-Band enthält wieder vielfältige Anregungen aus verschiedensten Richtungen der Psychoanalyse.